If you’ve been involved in a car accident, you will need to see a doctor to evaluate your injuries. This is true regardless of whether you’re pursuing a claim or just want to make sure you are fine and don’t require any further treatment. Injuries caused by motor vehicle accidents are not always obvious. For example, you might not see any tissue damage or have any broken bones, but you can still end up with long-term back or neck pain if you don’t seek early and appropriate treatment. We understand that accidents happen and that they can make a huge impact on your life. They cause a lot of pain and increase stress in many ways. To make it a lot easier on you we have put together the following information that covers nearly everything you need to know about how to reduce the pain and the stress from your accident. We have helped hundreds of people who have been in auto accidents over the past 25 years. The information listed below highlights what we have found to be the most helpful for the hundreds of patients we have seen who have been involved in auto accidents. This may be your first accident but it is not ours. We will help you navigate all the different parts of your care from the injury to the paperwork. Find the best doctor or therapist for the type of injuries you have. Get an accurate diagnosis so you can get the most effective treatment. Find someone who will help you understand exactly what has happened to your body and how to get better fast. Have a clear picture of how long it takes to get better. Learn proper pain relief skills, proper stretching and exercises to heal optimally. Understand how PIP or 3rd party auto accident insurance works. How We Can Help: The More You Know the Better You Will Feel! There are so many things to consider after you have been in an accident and for most people this can be overwhelming. Being injured is hard enough but how you choose to approach your care can make a huge impact on how fast and well you heel. We have 3 doctor, 3 licensed massage therapists, an acupuncturist, and a personal trainer who are experts with auto injuries and they are truly caring people. Our state of the art facility and doctors who specialize in auto accident injuries will get you the most accurate diagnosis to enable a faster and more effective treatment. We will teach you stretches and exercises along with techniques to protect yourself during the course of your care. You will have a clear understanding of how long it will take you to heal properly. We offer consistent education of proper lifting, moving, stretching, and strengthening techniques to feel better now and years following the accident. Our Insurance/Billing specialist and Financial Coordinator will help you find out all the details of your coverage so you don't have to stress about your care. If you have any questions about coverage for your care, please call Chrystal or Linda Beers at (262) 646-5800. Whiplash is a non-technical, non-medical term used to describe a number of neck injuries. 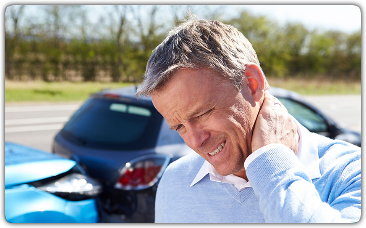 Although, whiplash can be caused by a number of things, it’s most commonly associated with car accidents and it occurs when the impact of a crash causes your head to snap forward and then back. The injury is considered more serious if more areas of the body are involved. For example, if you feel pain or numbness in your arms or shoulders, this indicates a more serious problem than if you only feel discomfort on your neck. If we suspect a fracture, dislocation, or soft tissue injury, they might recommend x-rays or a MRI to evaluate the extent of the damage. In most cases, whiplash is treated through rest, adjustments, massage therapy, and the application of ice/heat. Depending on the type of car accident you were involved in, you might also experience mid or lower back pain. This is different to whiplash, which affects the upper part of your back and shoulders. Back pain due to a car accident can be short-term, mostly caused by the sudden jolt or force of the impact. Short-term pain is often connected to a muscle injury. Back pain can also be chronic, which often occurs when the spine or tissues surrounding the spine are damaged. Left untreated, pain can lower your quality of life and lead to other problems in the future. Dr. Dan or Dr. Brandon will evaluate the reason for your back pain through a series of x-rays, if necessary, depending on the location and the type of pain you’re experiencing. They will recommend treatment accordingly to allow you the opportunity to function optimally again. Soft tissue injuries are injuries to the nerves, tendons and ligaments. Sometimes the muscles are also injured during a car accident. These type of injuries can vary from mild sprains and strains to micro-tears of the fibers of the muscle and tendons. Whiplash is a form of soft-tissue injury, but you can also injure your back, shoulders and even arms during a car accident. Soft tissue damage is hard to diagnose because it sometimes doesn’t show in x-rays or other machinery. At our clinic, we look not only at the results of tests, but also at your symptoms and levels of pain and discomfort to diagnose a soft tissue injury and help you find the best treatment option for it. Don’t delay – get motor vehicle accident care as soon as possible to prevent health complications/residual effects in the future. If you have suffered a workplace injury, you are entitled to workers compensation care. Common workplace injuries include a herniated disc from lifting a heavy object, an accidental slip and fall on a wet floor, repetitive stress injuries, carpal tunnel syndrome, or chronic back pain due to long hours hunched over a computer. If you have sustained a workers compensation injury, then prompt treatment is essential to helping the body heal and preventing chronic pain. The earlier you seek diagnostic care, the more our office can do to help prevent the build-up of scar tissue. However, it’s never too late to help the body heal. Whether you sustained your injury last week or last year, our wellness team is here to help. Dr. Dan Murray, Dr. Brandon Meye, and Dr. Morgan Reimer have over 30 years of combined experience treating workers compensation injuries. Our treatment approach begins with diagnostic care to determine the precise cause of injury. Next, we will create a custom treatment program that addresses your specific pain management and injury rehabilitation needs. Our goal with every patient is to not only relieve pain, but also correct the underlying cause. By doing so, we help reduce the risk for future injury. We frequently integrate chiropractic care with massage therapy, physiotherapy and corrective exercises to promote internal healing and speed the recovery process. At Lake Country Health Center, we follow the Empowerment Model for health care. We consider ourselves to be your partner in helping your workplace injury heal. We will give you the tools and knowledge you need to take control of your well being. From injury prevention tips to office ergonomic adjustments, we proactively support whole body wellness. One of the most common workplace injuries is headaches and migraines, chronic back pain and neck pain due to improper posture. Poor ergonomics, including a chair that is too high or low and a poorly positioned laptop or keyboard, can cause workers to spend long hours hunched over their desks. This leads to chronic shoulder pain, neck pain and low back pain. Once this pain develops, corrective exercises and myofascial therapy can help manage the pain symptoms. Ergonomic change to the desk, chair and computer are essential to reducing strain on the musculoskeletal system. Exercises to strengthen the body’s core and open the shoulders help provide a strong foundation while counteracting any hunching. A herniated disc occurs when a vertebra in the spine slips out of alignment. This is a common injury following an accidental slip and fall or improperly lifting heavy objects. If this disc compresses nearby nerves, patients may experience radiating pain in the legs, buttocks or lower back. This is symptomatic of sciatica, a chronic pain condition caused by a herniated disc. If you have sustained a herniated disc injury, chiropractic care is essential to restoring proper alignment to the spine. As long as a mechanical misalignment persists, then you will continue to experience back pain, neck pain, headaches and migraines. Additionally, repetitive motion injuries are also very common and respond well to chiropractic care and corrective exercises. Repetitive motion injuries include carpal tunnel syndrome from poor positioning while typing or making the same movement over and over. These types of injuries manifest over time, typically with the pain gradually increasing as the motion is continually made. Corrective exercises are helpful in strengthening the area of the body affected and preventing future injuries. Don't let a workplace injury become a life-long problem: contact us today at 262-646-5800.